Can Man City get revenge in the Premier League? Got your breath back yet? Well it's time to go again. Same teams, same stadium, same result? Unlikely, but Man City have a Premier League title to win and Spurs will want to show that going through on Wednesday was no fluke. You're in the right place to get a Man City vs Tottenham live stream - regardless of where on Earth you are. 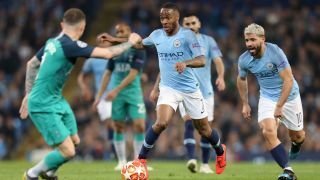 The Manchester City versus Tottenham Hotspur grudge match is back at the Etihad Stadium on Saturday, April 20. Kick off is at 12.30pm BST in the UK, which is 7.30am ET, 4.30am PT, and 9.30pm AEST. But that's exactly what Spurs have done over the last couple of weeks. And they will want to embrace the confidence and take it back to the Etihad today. Without talismanic striker Harry Kane, they'll be weakened in attack. But Son Heung-Min has shown that he's more than capable of leading the Spurs front line. If you're abroad this weekend but still want to watch your home coverage, you'll need a VPN to do so. That's because your normal coverage will be geo-blocked. It's really easy to do and stops you having to tune in to some dodgy stream you've heard about on Reddit. This is the #1 rated best VPN in the world right now. You can watch on many devices at once including Smart TVs, Fire TV Stick, PC, Mac, iPhone, Android phone, iPads, tablets etc. Check out Express VPN and get 3 months extra free when you sign up for an annual plan. And don't forget that a VPN isn't just for football...there's loads you can do with them. From unblocking restricted sites and watching Netflix in other countries to adding an extra layer of security for online shopping and banking. Manchester City vs Tottenham Hotspur (kick-off 12.30pm BST) is being broadcast on Sky Sports. Subscribers who may be out and about during the match can tune in via their mobile device using Sky Go. If you're not a Sky customer, you still have the option of a Now TV day pass for £8.99 which will enable you to catch the game live without the hassle and cost of a full on Sky Sports subscription. Out the country but keen to catch the UK coverage? Use a VPN and head to either your Sky Go or NOW TV account. NBC is the official US broadcaster for the 2018/19 season and kick-off for this game is at 7.30am ET or 4.30am PT. If you don't have cable then you can tune in on streaming services such as Sling, PlayStation Vue and Fubo (all of which have a free trial). Sportsnet is the channel showing the Man City vs Spurs clash in Canada, so ideal if you're a cable customer. Kick-off is at 7.30am Toronto time. Result! SBS has Man City vs Spurs as its weekly Premier League game, which means free viewing down under. Kick-off is at 9.30pm. As with every Premier League game this season, Optus Sport will also have live coverage, and using a VPN will allow you to watch the coverage on SBS or your Optus account even if you're currently abroad. BeIN Sport has won the rights to show the EPL in NZ, and you can watch the Premier League football live late Saturday night. Star Sports is the place to tune in for Premier League games in India and Manchester City vs Tottenham Hotspur kicks off at 5pm New Delhi time.